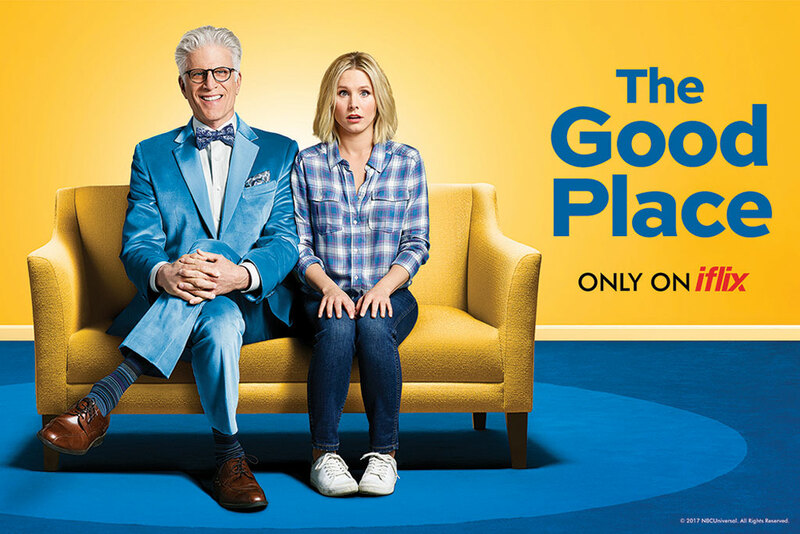 iflix is thrilled to premiere the new hit comedy, The Good Place. All thirteen episodes of the hilarious first season are now available to stream or download in the Philippines, only on iflix. From Executive Producer Michael Schur (Brooklyn Nine-Nine, Parks and Recreation and Master of None) comes a smart, unique comedy about what makes a good person. The show follows Eleanor Shellstrop (Kristen Bell - House of Lies, Veronica Mars), an ordinary woman who enters the afterlife and, thanks to some kind of error, is sent to the Good Place instead of the Bad Place, which is definitely where she belongs. While hiding in plain sight from Michael (Ted Danson - CSI, Cheers), the wise architect of the Good Place (who doesn't know he's made a mistake), she's determined to shed her old way of living and discover the awesome (or, at least, the pretty good) person within. The Good Place joins iflix’s fantastic slate of exclusive, critically acclaimed and popular shows including Emerald City (fast-tracked from the U.S.), Mr. Robot, The Magicians, Channel Zero: Candle Cove, Aftermath, Fargo, Black Sails and many more. With more than five million members across the region and over five billion minutes streamed since launch, iflix has established itself as the clear market leader in video streaming. Now available in 10 territories across Southeast Asia, including recent launches in Pakistan, Vietnam and Myanmar, iflix additionally announced its Joint Venture with Zain, iflix Arabia, to make its world class service available in the Middle East and North Africa region. Offering consumers, a vast library of top Hollywood, Asian regional, and local TV shows and movies including many first run exclusives and award-winning programs, each subscription allows users to access the service on up to five devices, including phones, laptops, tablets, and television sets, for viewing wherever, whenever. iflix subscribers can also download TV shows and movies from iflix’s extensive catalogue for offline viewing. The service is priced at only PHP129 per month in the Philippines for unlimited access with no ads!